We’ve seen some great multivitamin brands set records here on B5. For instance, EFX Sports VitaDrive is the undisputed King of B Vitamin Content. No other dietary multivitamin comes close. Well, VPX MEDIVIN is about to shatter some records (and possibly supplement ratings), folks. That should be enough to pique your interest for another awesome review. King of vitamin D. Insane 1,250 percent of the daily value. King of Manganese. Impressive 250 percent of the daily value. Liquid Delivery System. Improves bioavailability and overall results. Other Ingredients: Safflower oil, sunflower oil, sodium bicarbonate, gelatin, cocoa butter, sunflower lecithin, beeswax, corn oil, purified water, and polysorbate 80. Directions: Take one packet daily with meal. Most of the multivitamins we have reviewed here on B5 are top-notch. They increase energy levels, fill nutrition gaps, and help you achieve your bodybuilding goals, among other things. We’re sure this product will be the go-to multivitamin of many athletes and active individuals. With that in mind, we’ve stumbled upon another vitamin which has tremendous potential. This product is “scientifically-formulated to be the cream of the crop of liquid multivitamin supplements,” per its official website. VPX MEDIVIN “uses a liquid delivery system that helps your body absorb almost 100 percent of the nutrients,” per the same source. Meet the 100% Natural Liquid Vitamin & Mineral Delivery System. The company also says high heat and pressure turn minerals into rocks – one of the factors why leading multivitamin brands have roughly zero to four percent absorption. While this may seem like a sixth-grade Science lesson to some folks, it makes a great deal of sense to us. If you think about it, why should you bother with a multivitamin with a crappy absorption rate? Not only is it a waste of time, but it’s also a waste of money – a double whammy. It sure seems to us VPX MEDIVIN is a breath of fresh air, folks. Okay, one of the first things we look for in a multivitamin is a “GMP,” “All-Natural” or “ISO-Certified” stamp of approval. We found none on VPX MEDIVIN. That could mean this product has synthetic ingredients. Watch out. So much for VPX MEDIVIN being a breath of fresh air. Let’s see if it can redeem itself in other aspects. Here’s the thing: the manufacturer doesn’t mention anything about this being an athlete multivitamin. However, it seems to be a suitable choice for athletes and active individuals. Granted, VPX MEDIVIN’s B vitamin arsenal doesn’t measure up to the likes of EFX Sports VITADRIVE (its vitamin B1 content has an insane daily value of 13,333 percent, for instance). Nonetheless, we’re confident the former will help improve your heart health and ramp up your energy levels. In addition, some fitness experts say VPX MEDIVIN’s vitamin C, vitamin E, and calcium combination produce a synergistic effect for more fat loss and shorter recovery time. That’s music to any athlete’s ears. Another thing which leaps out at us is VPX MEDIVIN’s unreal vitamin D content. We have just crowned the new king of D vitamin content, folks – VPX MEDIVIN’s vitamin D level is far and away the most we’ve seen among multivitamins. Again, it’s a clear indication VPX MEDIVIN is suitable for athletes and the like. So, if you need vitamin D, you know which brand you should purchase. According to Erin Michos, associate director of preventive cardiology at John Hopkins University, there is no solid evidence vitamin D supplementation has a profound impact on heart health. On the flip side, VPX MEDIVIN doesn’t have any vitamin K (a vitamin which helps regulate blood sugar levels and blood clots, regulates immunity and digestion, and strengthens bones). It’s one of the most neglected ingredients – we’ve seen one too many multivitamins which don’t have vitamin K.
As for VPX MEDIVIN’s mineral components, we feel they’re balanced enough – you’ll get ample amounts of iodine and zinc, for instance. Here’s another thing we noticed about this multivitamin – the extra emphasis on manganese. Many multivitamins will give you around 100 percent of the daily value or so for this mineral. On the other hand, VPX MEDIVIN takes it to a different level – 250 percent of the daily value (equal to the recommended daily intake of 5 milligrams). So, why the emphasis on manganese? There’s no question athletes and non-athletes alike will reap this mineral’s awesome benefits. Our educated guess: it’s the manufacturer’s way of standing out from the rest of the field. In a cutthroat industry, there’s nothing wrong with that. Another key feature of VPX MEDIVIN are the additional ingredients which give you awesome health benefits. We love the inclusion of 348 milligrams of fish oil, a source of “omega-3 fatty acids to support mood and health,” per the label. More specifically, omega-3 fatty acids are excellent for the heart and eyes. Speaking of vision health, one serving of this multivitamin yields 500 micrograms of lutein (a carotenoid and antioxidant which helps keep inflammation at bay), a staple among many eye support supplements. When a multivitamin has lutein, that speaks volumes about its comprehensiveness. Not too many multivitamins have it. Now, if you want increased antioxidant protection, five milligrams of glutathione per serving is your answer. We also love this multivitamin’s betaine anhydrous content – it’s an amino acid which helps ramp up muscle strength, power, and endurance. It’s also a popular inclusion in many pre-workout supplements. The other additional components such as inositol, lactoferrin, rutin, and acai berry extract are solid, in our opinion. On that note, VPX MEDIVIN isn’t as comprehensive as the likes of Optimum Nutrition OPTI-MEN. Nevertheless, the former is a solid choice which will not only help plug in those nutrition gaps, but safeguard your long-term health as well. Calories, 27: We don’t think VPX MEDIVIN’s 27 calories per serving will get in the way of your nutritional goals, folks. Calories from fat, 27: This comes as no surprise considering this multivitamin’s fish oil content. Don’t worry, it contains omega-3 fatty acids which help boost heart health and vision. Total fat, 2.5 g: Like we said, no need to fret – VPX MEDIVIN’s omega-3 fatty acids content will help supercharge your health. No doubt about it. Sodium, 100 mg: This is equal to just four percent of the daily value for sodium. For reference, a daily value of five percent or lower has a low value. This means individuals who are monitoring their sodium intake can still consume VPX MEDIVIN. Protein, 1 g: VPX MEDIVIN is not a significant source of protein at just two percent of the daily value. Vitamin A (as beta-carotene), 15,000 IU: A vitamin for improved vision, stronger bones, and increased muscle mass. Vitamin C (as ascorbic acid), 500 mg: A powerful antioxidant which helps keep free radicals at bay, boost heart health, improve vision, and produce collagen. Vitamin D3 (as cholecalciferol), 5,000 IU: VPX MEDIVIN has the biggest vitamin D content among leading multivitamin brands. This vitamin helps improve heart health, keep free radicals at bay, and strengthens bones. Vitamin E (as d-alpha-tocopheryl acetate), 3o IU: This ingredient helps shorten recovery time, ward off cataracts, improve cardiovascular health, and regulate metabolism. Thiamine (as thiamine hydrochloride), 25 mg: Vitamin B1 helps improve heart health and increase energy levels. An impressive 1,667 percent of the daily value should go a long way. Riboflavin (vitamin B2), 25 mg: This ingredient helps ramp up energy levels and regulate the immune and digestive systems. One thousand four hundred seventy-one percent of the daily value is a sure bet, folks. Niacin (as niacinamide) 50 mg: Simply known as vitamin B3, this ingredient helps shore up joint mobility and cardiovascular health. Vitamin B6 (as pyridoxine hydrochloride), 25 mg: A vitamin which helps regulate homocysteine (a non-protein amino acid which has detrimental effects) levels for improved heart health. Folate (folic acid), 800 mcg: Also known as vitamin B9, this component helps regulate cholesterol levels and shore up cardiovascular health. Vitamin B12 (as methylcobalamine), 100 mcg: Just like vitamin B1, vitamin B12 helps boost heart health and ramp up energy levels. Coincidentally, they have the same daily value (1,667 percent) in VPX MEDIVIN. Biotin, 100 mcg: This B vitamin helps improve hair, skin, and nail health. It also helps keep inflammation at bay and repair muscle tissue. Pantothenic acid (as d-calcium pantothenate), 10 mg: Also known as vitamin B5, this ingredient helps increase stamina, shore up cardiovascular health, regulate the immune system, and lower stress levels. Calcium (as calcium carbonate), 100 mg: This mineral helps promote healthy blood pressure levels, boost heart health, and strengthen bones. Ten percent of the daily value is not high, by all means. Iodine (as potassium iodide), 150 mcg: This ingredient helps regulate thyroid function and keep bacterial activity in check. Magnesium (as magnesium oxide), 100 mg: This mineral helps regulate nerve function, promote muscle relaxation, improve cardiovascular health, and strengthen bones. Zinc (as zinc sulfate), 15 mg: This versatile mineral strengthens bones, increase testosterone levels, promote restful sleep, increase immunity, and keep free radicals at bay. Copper (as cupric sulfate), 250 mcg: This mineral helps regulate the immune system, boost iron absorption, and stop free radical activity dead in its tracks. Manganese (as manganese sulfate), 5 mg: VPX MEDIVIN’s 250 percent of the daily value for manganese is one of the highest – if not the highest – among multivitamin brands. Manganese helps regulate blood sugar levels, regulate metabolism and digestion, improve thyroid function, and ward off inflammation and free radicals. Chromium (as chromic chloride), 200 mcg: A mineral which helps regulate insulin sensitivity for increased muscle mass and fat loss. Molybdenum (as ammonium molybdate), 50 mcg: Helps increase energy levels and promote efficient waste elimination from the kidneys. Potassium (as potassium sulfate), 99 mg: VPX MEDIVIN is not a significant source of potassium at a paltry three percent of the daily value. Lactoferrin, 50 mg: A naturally-occurring milk protein which helps boost the immune system and keep bacterial activity at bay. Fish oil, 348 mg: Comprised of two types of omega-3 fatty acids – EPA (115 milligrams per serving) and DHA (77 milligrams per serving). Both are unsaturated kinds of fats which help improve neurological function, boost vision, and shore up heart health. Inositol, 50 mg: A chemical compound which helps lower stress levels, boost circulation, and improve heart and skin health. Para aminobenzoic acid, 1 mg: This ingredient helps regulate skin, hair, and digestive health. Rutin, 30 mg: A bioflavonoid which helps keep inflammation at bay, promote collagen formation, lower bad cholesterol levels, and boost vitamin C absorption. Beta 1,3/1,6 glucan polysaccharide, 2.5 mg: VPX MEDIVIN is one of the rare multivitamins which has beta-glucans, sugars which helps keep cholesterol levels in check. This, in turn, results in better heart health. Betaine anhydrous, 25 mg: A popular bodybuilding supplement ingredient which helps increase strength, power, and endurance. L-glutathione reduced, 5 mg: An antioxidant which helps ward off free radicals, ramp up energy levels, slow down the aging process, regulate the immune system, improve sleep quality, increase focus, and improve exercise performance. Glutathione is a bona fide virtuoso. Lutein, 500 mcg: A carotenoid and antioxidant which helps offset the effects of poor nutrition and sunlight overexposure on the eyes. Lutein also helps keep inflammation at bay. Acai berry extract, 11 mg: A fruit extract which helps ward off free radicals, boost weight loss, and boost mental and sexual function. It’s clear to us VPX MEDIVIN has its own identity from the get-go. In a competitive bodybuilding supplement industry where you’re trying to sing customers’ praises, that’s a good thing. Just what makes VPX MEDIVIN so unique? It has high B vitamin content for ramped-up energy levels and better cardiovascular health. If 1,667 percent of the daily value for vitamin B1 and vitamin B12 don’t get your attention, nothing will. It bears repeating: VPX MEDIVIN may not have the sky-high B vitamin levels of say, EFX Sports VitaDrive, but it’s solid, nonetheless. We also laud the synergistic effects of this multivitamin’s vitamin C, vitamin E, and calcium components for more fat loss and shorter recovery time. Moreover, VPX MEDIVIN is the undisputed King of Vitamin D content among multivitamins. How does an impressive 1,250 percent of the daily value grab you, folks? While experts are torn on the link between cardiovascular health and vitamin D supplementation, we’re confident the latter can still help strengthen bones and ward off free radicals. If you’re also not getting enough vitamin D from sunlight, you should buy this multivitamin. Not only is VPX MEDIVIN the King of Vitamin D content, it’s also the best source of manganese (250 percent of the daily value) among leading multivitamin brands. We also love the additional ingredients such as fish oil, inositol, para aminobenzoic acid, rutin, betaine anydrous, and lutein. Expect better heart health, increased antioxidant protection, ramped-up strength and endurance, among other things. Even though VPX MEDIVIN isn’t as comprehensive as, say, Optimum Nutrition OPTI-MEN, it will still help boost long-term health. Perhaps the most impressive feature of VPX MEDIVIN is its efficient liquid delivery system. Long story short, this supplement has excellent bioavailability (which translates to better overall results). Customers swear by it. The manufacturer also lists all of the ingredient amounts – that’s excellent transparency for you. First, we noticed VPX MEDIVIN has no “GMP,” “ISO-Certified,” and “All-Natural” label. Like we said, that could possibly mean this product has fillers. 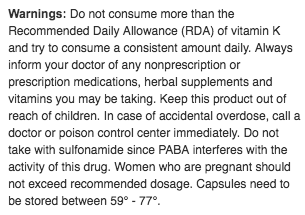 Don’t get us wrong, VPX MEDIVIN’s ingredient lineup is impressive, but it wouldn’t have hurt one bit to include vitamin K.
That would have made it more comprehensive. Lastly, VPX MEDIVIN is slightly expensive at $44.99 for a 30-packet box (in contrast, a 60-serving bottle of Axis Labs ENDOSHIELD costs just $30.00). We just hope prices for unique products like this would go down. It must be the cost of the liquid delivery system process. In any case, VPX MEDIVIN is a solid bet for athletes and non-athletes alike. It’s a unique multivitamin which should give you a fast return on your investment. You’ll be one happy customer. We agree with all of these claims. While not perfect, VPX MEDIVIN is a worthy addition to any supplement stack. 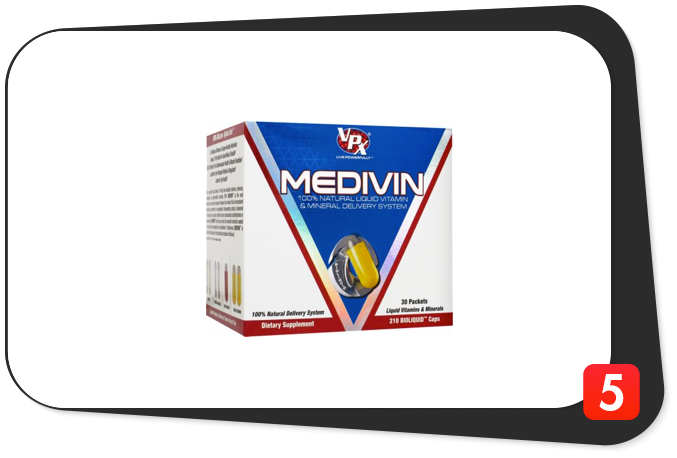 The manufacturer intended VPX MEDIVIN for healthy and active individuals who are at least 18 years of age who want to increase energy levels, fill nutrition gaps, achieve their daily fitness goals, and improve overall quality of life. VPX MEDIVIN has 250 percent of the daily value for vitamin B3 or niacin, which may cause a burning sensation in the face and neck regions in some individuals. If this, or any other ingredient, makes you feel doubtful, please consult your physician before consuming. Impressive ingredients. Simply put, this is a multivitamin with a unique identity. High B vitamin content. Perfect for athletes and active individuals. King of vitamin D among multivitamins. A whopping 1,250 percent of the daily value. Synergistic effects of vitamin C, vitamin E, and calcium. Increased fat loss and shorter recovery time. Extra health benefits. Courtesy of fish oil, rutin, lactoferrin, betaine anhydrous, etc. Excellent bioavailability. Efficient liquid delivery system. Awesome transparency. Manufacturer breaks down every ingreident amount. Thumbs up. No vitamin K. Would have made it more comprehensive. Possible inclusion of fillers. No “All-Natural” or “ISO-Certified” label. Bummer. Expensive. $44.99 for a 30-packet box. It’s abundantly clear VPX MEDIVIN has way more pros than cons. You just can’t pass up on the high B vitamin, vitamin D, and manganese content and synergistic effects topped off by an efficient liquid delivery system. While it’s not a perfect multivitamin, VPX MEDIVIN more than holds its own. We recommend active men and women buy it. If an “All-Natural” and cheaper version comes out, better.